Every science-fiction movie worth its salt predicts a world where we speak to computers rather than typing in data. Normal conversation is about 150 words per minute, whereas even an expert typist can only type at 90 words per minute. More important, talking is the most basic form of communication. The reality is that there are many technical obstacles to having voice recognition match the ideal of a computer perfectly interpreting the meaning of any user’s verbal instructions. When Bixby includes Voice, you’ll be able to make a phone call, send an email or a text, search the web, or even update your Facebook status and calendar with voice commands. Say you want to call someone. However, if you know several people named Bill, your phone asks you (in a semi-pleasant voice) which “Bill” you want to call. If you want to call Bill Boyce, a person from your contact list, say “Call Bill Boyce.” Within a moment, his phone rings. A few pointers for using Bixby. If you hesitate, Bixby assumes that you are not ready to talk and goes into a sleep mode. To wake it up, just say “Hi, Bixby.” It wakes up, ready to resume listening. To send a text, say the words, “Send a text.” Done. The text screen pops up. Bixby asks you, “Who would you like to message?” Give the name. It looks up their number from your contact list. In this figure, the name “Ludwig van Beethoven” was spoken. 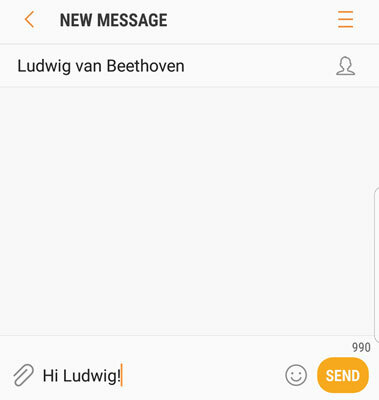 Bixby then asks you for your message. Go ahead and say what you would have typed. Bixby then converts your words into a message. It displays what it thinks you said in a box similar to the box shown. The text prepared by Bixby, ready to go. Read it before you send it. If it is correct, just say “Send” and off it goes. If it’s incorrect, you can say “Cancel,” and it won’t send that message. You can then try again.